Scottish small-ship cruising operator The Majestic Line has confirmed a new purpose-built vessel will be delivered on Bute for its 2019 summer season. The build of ‘Glen Shiel’ begins this month at Ardmaleish Boatbuilding on Bute, and will see Dunoon-based Majestic Line’s newest boat in operation in 2019 – the company’s 15th year of operation. Named after a tranquil Glen on the North West Mainland, Glen Shiel will complement the three existing boats, with design features such as more powerful engines for faster sailing and an improved observation saloon. Similar to sister ship Glen Etive, she will undertake 10-night cruises, this time sailing to the West coast of the Outer Hebrides, St Kilda and rugged and remote Wester Ross. Accommodation will comprise of seven en-suite double or twin cabins taking a maximum of 12 passengers including space for two singles. With bookings at an all-time high, Majestic Line directors Andy Thoms and Ken Grant felt it was the right time to add to their growing fleet. Andy started designing Glen Shiel when forward bookings of Glen Etive started to sell out. He said: “All three of our small ships are fully booked for the 2018 season and we need more capacity for the future. “We have therefore commissioned another new vessel from the Ardmaleish Boatbuilding Company, who made such a splendid job of the last ship, the ‘Glen Etive’. 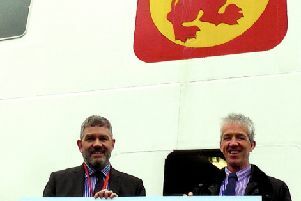 This new vessel illustrates the current demand for small ship cruising, and with The Majestic Line at the forefront of this emerging market, Malcolm Roughead OBE, chief executive of Visit Scotland, said: “It is fantastic to see a small privately run company succeeding through vision, hard work and attention to detail. “The building of a fourth boat is great news for Scottish tourism and highlights the importance of the marine mix in the Scottish tourism product.